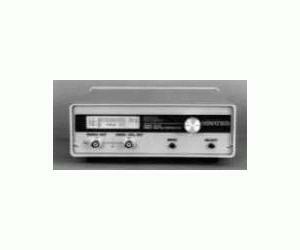 The Model 2910B is a 30MHz DDS Signal Generator in a table top instrument case. The 2910B generates a synthesized output simultaneously from 100Hz to 30MHz in 1μHz steps. The 2910B can be locked to an external frequency standard or used with its internal temperature compensated crystal oscillator (TCXO). The internal TCXO provides ±1ppm accuracy. Sine, TTL or squarewave differential outputs are available. Simple front panel controls or RS232 allows setting of all parameters, which can be saved into non-volatile memory upon power down. A 1U rackmount version is available.